Microsoft might not offer free Windows 8 upgrades to customers who buy new PCs in the months before the new operating system launches. Instead, Microsoft will charge a fee for the so-called "Windows 8 Offer," according to Mary Jo Foley at CNet. 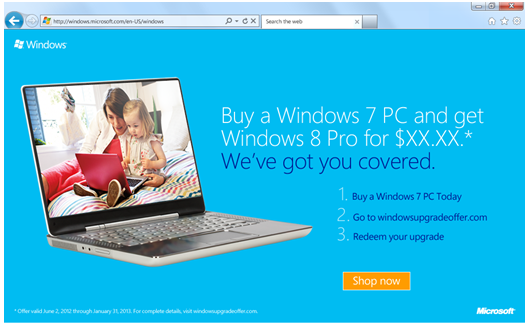 Foley's sources claim that anyone who buys a new Windows 7 PC after June 2 will get a discounted upgrade to Windows 8 Pro. So far there's no word on how much the upgrade will cost. In the past, Microsoft and PC makers have offered free upgrades to prevent sales from dropping off before the new version of Windows comes out. Customers were able to upgrade to the corresponding version of Windows. For example, PCs running Windows Vista Ultimate could get an upgrade to Windows 7 Ultimate. Foley's report suggests that an upgrade to Windows 8 Pro will be the only option available, even for consumers with low-end versions of Windows 7, such as Home Basic and Home Premium. Windows 8 Pro includes BitLocker support, remote desktop hosting, and an encrypting file system, among other features. Although the apparent fee for Windows 8 upgrades seems like bad news, keep in mind that two years ago, some PC makers charged as much as $17 in shipping and handling fees for Windows 7 upgrades. I'm just speculating, but Microsoft may be looking to charge a consistent fee and offer upgrades directly to prevent chaos.